Alessi, S.M. ; Hanson, T.; Wieners, M.; and Petry, N.M. Low-cost contingency management in community clinics: Delivering incentives partially in group therapy. Experimental and Clinical Psychopharmacology 15(3):293-300, 2007. Bannon, M.; Kapatos, G.; and Albertson, D. Gene expression profiling in the brains of human cocaine abusers. Addict Biol 10(1):119-126, 2005. Des Jarlais, D.C., et al. Convergence of HIV seroprevalence among injecting and non-injecting drug users in New York City. AIDS 21(2):231-235, 2007. Farrer, L.A., et al. Association of variants in MANEA with cocaine-related behaviors. Arch Gen Psychiatry 66(3):267-274, 2009. Gold, M.S. Cocaine (and crack): Clinical aspects. In: Lowinson, J.H., ed. Substance Abuse: A Comprehensive Textbook, 3rd edition, Baltimore: Williams & Wilkins, pp. 181-198, 1997. Hagan, H., et al. HCV Synthesis Project: Preliminary analyses of HCV prevalence in relation to age and duration of injection. 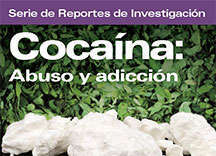 International Journal of Drug Policy 18:341-351, 2007. Institute for Social Research. Monitoring the Future, 2008 (Study Results). Ann Arbor, MI: University of Michigan, 2008. Data retrieved 12/11/2008 from http://www.monitoringthefuture.org. Martell, B.A., et al. Vaccine pharmacotherapy for the treatment of cocaine dependence. Biological Psychiatry 58(2):158-164, 2005. Shoptaw, S., et al. Randomized placebo-controlled trial of baclofen for cocaine dependence: Preliminary effects for individuals with chronic patterns of cocaine use. Journal of Clinical Psychiatry 64(12):1440-1448, 2003. Snyder, S.H. Drugs and the Brain. New York: Scientific American Library, 1996. Sokoloff, P., et al. The dopamine D3 receptor: A therapeutic target for the treatment of neuropsychiatric disorders. CNS and Neurological Disorders-Drug Targets 5(1):25-43, 2006. Substance Abuse and Mental Health Services Administration, Office of Applied Studies. Results from the 2007 National Survey on Drug Use and Health: National Findings. DHHS Pub. No. SMA 08-4343, Rockville, MD: SAMHSA, 2008. Suh, J.J.; Pettinati, H.M.; Kampman, K.M. ; and O'Brien, C.P. The status of disulfiram: A half of a century later. Journal of Clinical Psychopharmacology 26(3):290-302, 2006. Teich-Alasia, S. Burn care facilities in Italy. Burns 18(2):139-140, 1992. Tseng, F.-C., et al. Seroprevalence of hepatitis C virus and hepatitis B virus among San Francisco injection drug users, 1998 to 2000. Hepatology 46(3):666-671, 2007. U.S. Department of Health and Human Services, Substance Abuse and Mental Health Services Administration, Office of Applied Studies, Drug Abuse Warning Network (DAWN). Drug-Related Emergency Department Visits for 2004–2008. Datos obtenidos en línea de: https://www.datafiles.samhsa.gov/study-series/drug-abuse-warning-network-dawn-nid13516. Volkow, N.D., et al. Decreased striatal dopaminergic responsiveness in detoxified cocaine-dependent subjects. Nature 386(6627):830-833, 1997. Zhang, H., et al. Proopiomelanocortin gene variation related to alcohol or drug dependence: Evidence and replications across family and population-based studies. Biol Psychiatry. 2009 Feb 12; [Publicado en línea antes que en imprenta]. Zuo, L., et al. Interaction between two independent CNR1 variants increases risk for cocaine dependence in European Americans: A replication study in family-based sample and population-based sample. Neuropsychopharmacology. 2008 Dec 3; [Publicado en línea antes que en imprenta].